If you are planning to explore the wonderful Cabarita Beach and Tweed Coast attractions, make sure you also include the dining scene. The region offers diverse taste that will surely delight your palate. In fact, you will find one right on the ground floor of The Beach Cabarita. Our resort offers a Cabarita Beach accommodation ideal for couples and families on a holiday. Our two, three, and four bedroom apartments as well as penthouse units are well equipped and feature amazing views. The Beach Cabarita also offers a superb range of leisure facilities. So get ready to discover a new world of fun and relaxation with our onsite outdoor heated and unheated swimming pools, spa, fitness room and direct access to Cabarita Beach. Our luxury 4.5 star accommodation is the home of a four year young modern bistro. This perfect dining destination offers indoor and outdoor seating just metres to the white sands of the beach! When it comes to food, you won’t be disappointed with their selection of breads, burgers and other pub favourites, all made from quality ingredients. Try their toasted Turkish bread & dips or their grilled Cajun chicken & avo burger. If you prefer a larger meal, treat yourself to some caramelised onion & blue cheese arancini for starters followed by a seafood platter or a Cape Byron black angus rib fillet fresh from the grill for lunch. To fully enjoy your meal, why not order some drinks? The Bar & Grill has a range of fantastic local and imported beer, wine and spirits. 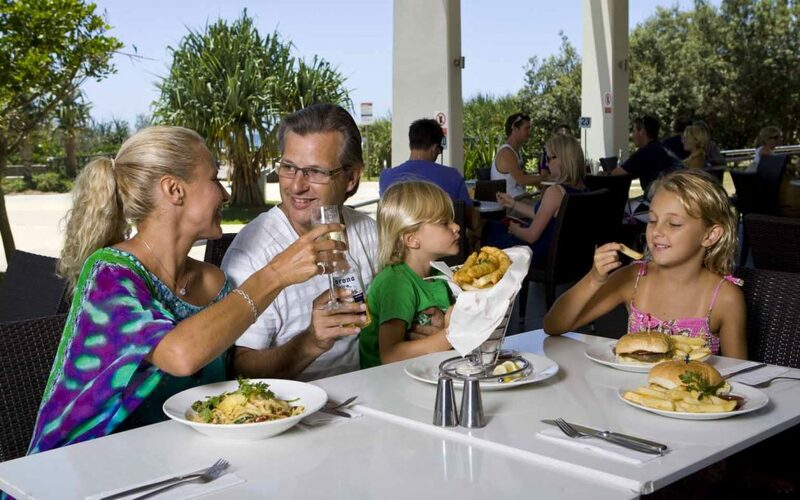 And if you plan on having a family lunch or dinner, the The Beach Bar & Grill is proud to be family-friendly. They even designed a menu fit for kids and it all comes with ice cream! Yes, ice cream, we all scream for ice cream! The Beach Bar & Grill also offer various specials you won’t want to miss, such as Monday Rump Night, Tuesday Asian Style Salad, Wednesday T-Bone Night, Thursday Chicken Schnitzel Night and Friday Lunch Special. Book your Kingscliff luxury accommodation at The Beach Cabarita and get ready for a great dining experience.